As I've said many a time in this column, I love finding a horror film with a unique premise, or one that covers familiar territory in a new way. I also simply adore a film where I don't have the ending figured out five minutes in, or a film with a twist or two that I don't see coming and don't cotton onto until just before, or better yet, just at, the film's revelation. As long as the film plays fair with the audience and doesn't pull a bait-and-switch (I'm looking at you, From Hell), a movie that can surprise me with its plot elements is the equivalent of an art aficionado unearthing an unknown work by a master painter; it just doesn't get much better than that. Identity succeeds in all these areas, and many more. The opening credits roll over scenes of a psychiatrist reviewing a case file. We soon learn that the psychiatrist was reviewing the case of an extremely vicious and sadistic mass murderer he has been treating. The good doctor is preparing for the clemency hearing he requested for his patient on the grounds that the death sentence imposed on the murderer is cruel and unusual punishment. A de facto parole board of sorts has convened, consisting of the lawmen, DAs and judge involved in the man's arrest and subsequent trial and conviction, to hear the psychiatrist plead his case. The convicted killer is also to be brought before this ad hoc gathering, both to demonstrate the doctor's findings and to hear what commutation, if any, of his sentence results from the proceedings. The assembled officers of the court are openly skeptical of the doctor's contention that the man they see as an unfeeling monster is actually severely mentally ill, suffering from dissociative identity disorder, or DID, commonly referred by laymen as multiple personalities. It is the psychiatrist's contention that only one of the man's many alters committed the crimes, and that it is possible to isolate that persona and confine, or perhaps even destroy, it, rendering the killer harmless while still carrying out the spirit, if not the letter, of the death sentence. The psychiatrist is asking that his patient's sentence be commuted to life in a mental hospital, where this arduous task can be undertaken (and although no mention is ever made of bringing the alters together into a cohesive whole, one would expect this is also part of the planned therapy, as it is the treatment goal for any DID sufferer). As the assemblage awaits its inexplicably-delayed prisoner, another group of people is converging on a desolate desert motel in the middle of a torrential downpour. All save the motel clerk are there through a series of mishaps, mistakes and accidents. Some of these events are related, either directly or indirectly; some not. With the storm growing in intensity and the surrounding roads flooded out, this gathering, ten in number, are cut off from the rest of the world and forced to make the best of their circumstances. Most troubling for the ten are a severely injured wife and mother desperately in need of medical attention, and the condemned murderer amongst them, who was being transported by a federal marshal to an important parole hearing when the road washouts halted their progress. Thus the two concurrent plotlines are established. As the collection of judiciary officials listen to the psychiatrist detail his clinical findings regarding the man whom all assembled agree is sick, the band of stranded travelers at the motel find they've been unwittingly cast in an impromptu staging of And Then There Were None, except in this version, it's a fairly obvious deduction that the killer is one of their number. As the body count rises and events turn even more bizarre, it fast becomes clear to the remaining Little Indians that they must solve the puzzle of what is happening, and soon, if they are to have any chance at survival. One of the most intriguing aspects of Identity is that in this age of market-researched, audience-tested corporate entertainment, the film can't really be pigeonholed. At first blush, Identity seems like your standard murder mystery all gussied up in the Sunday go-to-meeting clothes of a psychological thriller. Before long, the film appears to morph into your standard slasher, albeit still wearing its Sunday best. But while Identity has elements of all these genres, it is unique unto itself. It is a film that cannot easily be classified as any one thing, beyond the fact that it's a damned good movie. And as a mystery should, the film plays fair with its audience. All the clues needed to solve the puzzle are laid out before the viewer. They're not sledgehammer-to-the-head obvious, but neither are they hidden to the point that only the scriptwriter knows they're there, and sometimes he's not even sure. And while plot twists and fake endings, once the purview of the slasher and AEP flicks, have become somewhat de rigeur in nearly all films of late - and almost as stale as the proverbial day-old bread from the corner bakery - Identity manages to pull off both at the same time, and does a mighty fine job, thank you. No small feat in itself, this deftness of writing is the bits of chopped egg accessorizing the Beluga caviar nestled on perfectly-browned toast points that is the wonderful script. The cast is top-drawer all the way, headed by sturdy journeyman thesp John Cusack. 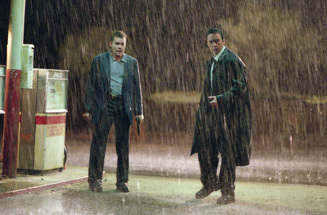 Called upon to be the proverbial eye of the hurricane, Cusack anchors the motel side of the storyline with a calm purpose and quiet intelligence that provides the perfect contrast to the mounting turmoil and terror that surrounds him. He is ably supported on his track of the parallel plot by Ray Liotta, John C McGinley and Amanda Peet, amongst others, and by Alfred Molina as the compassionate psychiatrist on the law-and-order arc. The film is also beautifully shot, with the claustrophobia of the marooned motel denizens contrasted in stark relief against the procedural efficiency of the courtroom proceedings. And the film's Spartan 90-minute running time seems almost too short; the plot keeps you pondering its arc not only during, but for some time after the final credits roll. In all, Identity is a smart thriller with a taut storyline, wonderful performances, and a core mystery that will not only keep you guessing, but will delight your right brain whilst not unduly disturbing your left.